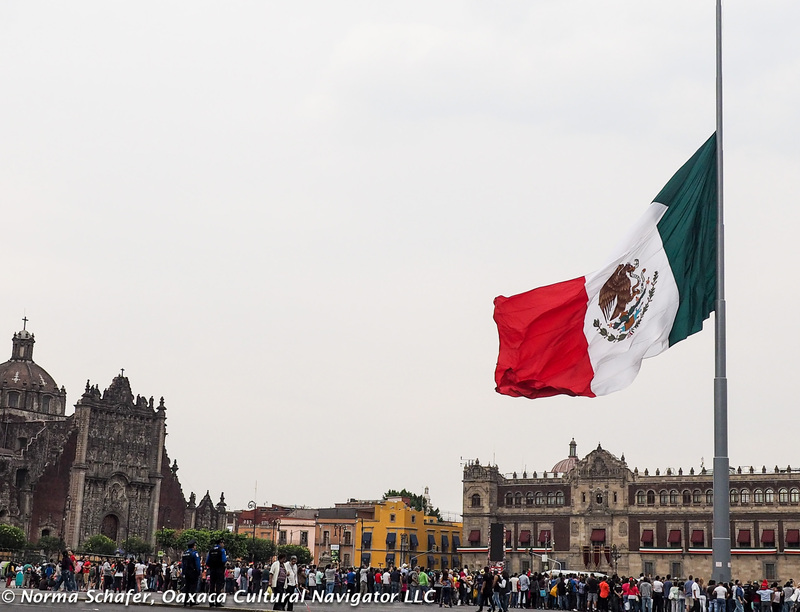 On September 16, 1810, Mexico declared her Independence from Spain. Hidalgo, a priest from Dolores Hidalgo, Guanajuato, gave out El Grito, the cry for freedom and the war began. The Spanish conquest of Mexico began in 1521, and after almost 300 years of occupation, the country followed the United States independence model to set itself free from European rule. 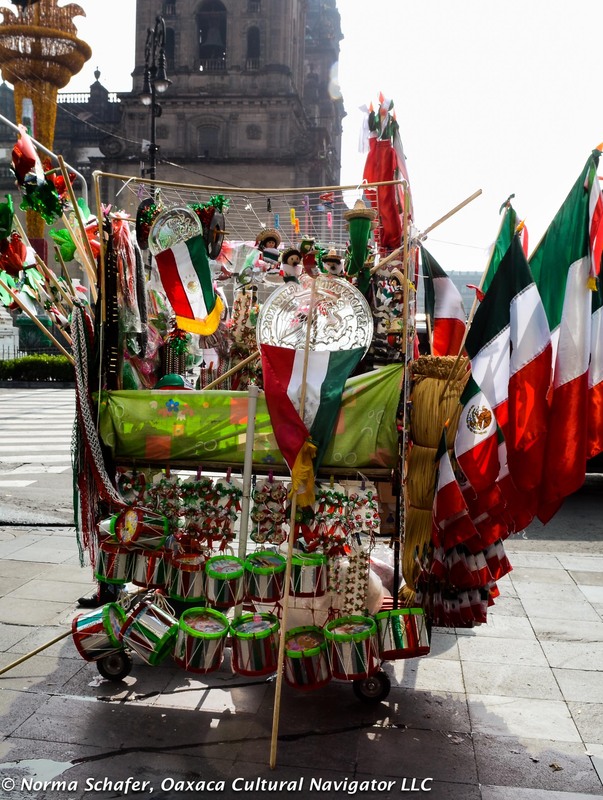 Many confuse Mexico’s Independence Day with either Cinco de Mayo or the 1910-1920 revolutionary war. Don’t be confused! The celebration began last night with the president of every state, municipality and village letting out the battle cry. 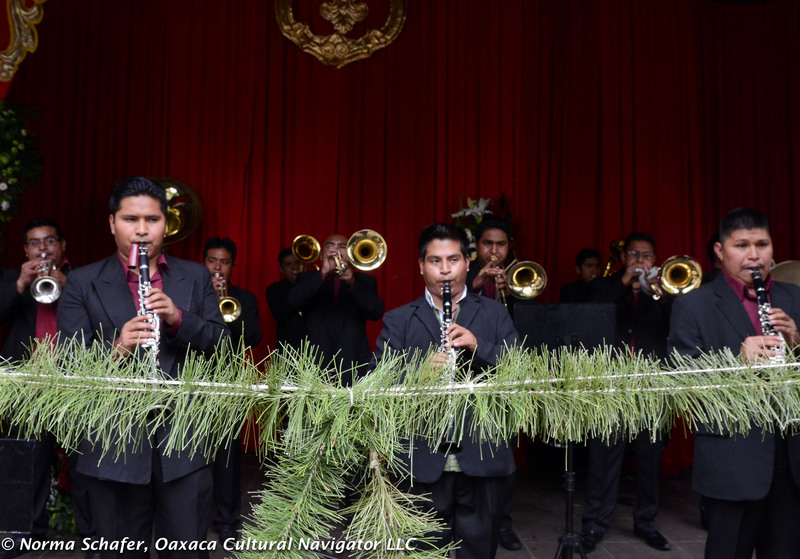 Here in Teotitlan del Valle, the call for freedom was accompanied by the bands from the elementary, middle and high school — Bandas de la Guerra — drumming and tooting well into the night. The cohetes, firecracker missiles, rang through the air. And, it started again this morning with a desfile (parade) through the streets. Red, white and green as a food display. 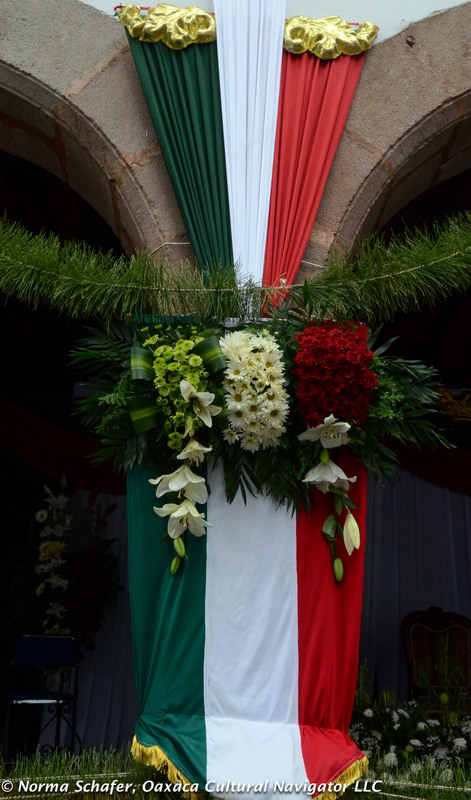 Happy Birthday, Mexico, our sister nation. A drum for every child? Why not! Viva Mexico! Happy Independence Day! 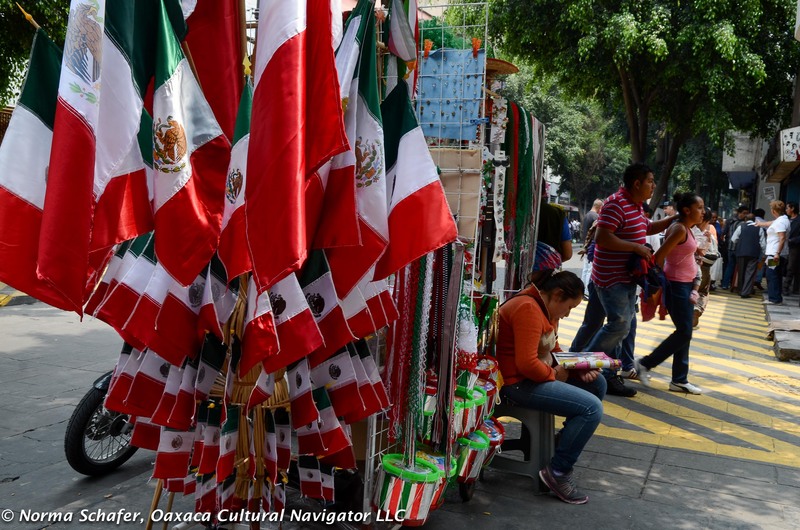 September 16 is Mexican Independence Day. 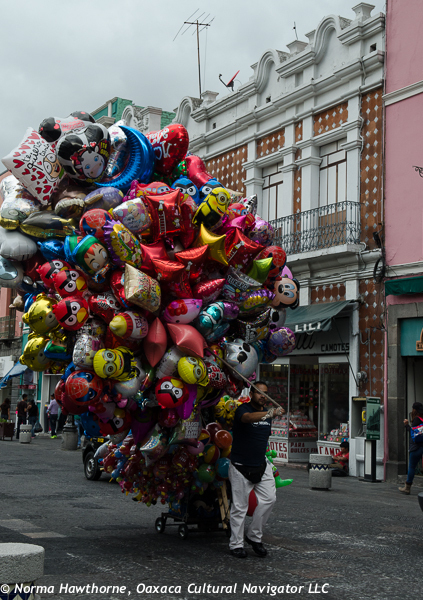 All this past week every city, town and village I’ve traveled through — from Mexico City to Tenancingo de Degollado to Morelia, Patzcuaro and Tzintzuntzan — is preparing for the celebration. 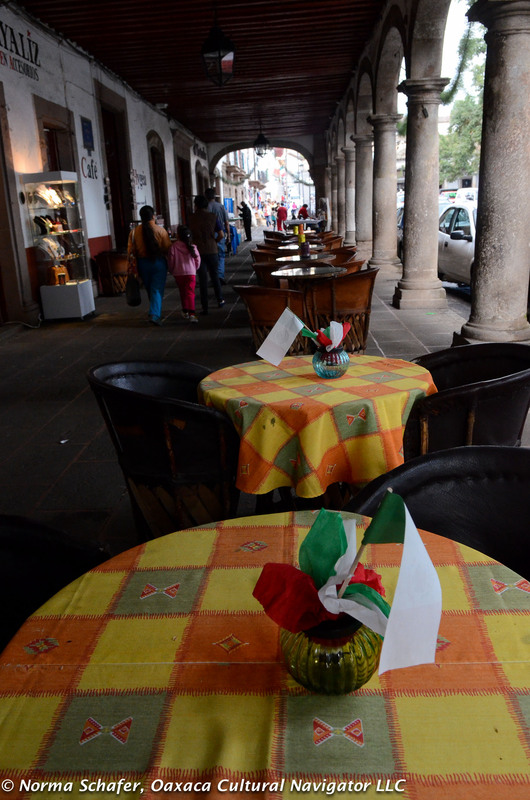 Right now, in Patzcuaro, Michoacan, the zocalo is filled with families waiting for the mayor to speechify. On September 15, a tall castle built of bamboo appeared. At ten o’clock at night the wheels at the top of the castle will spin and propel firecrackers and a pyrotechnics display skyward announcing the independence once again. 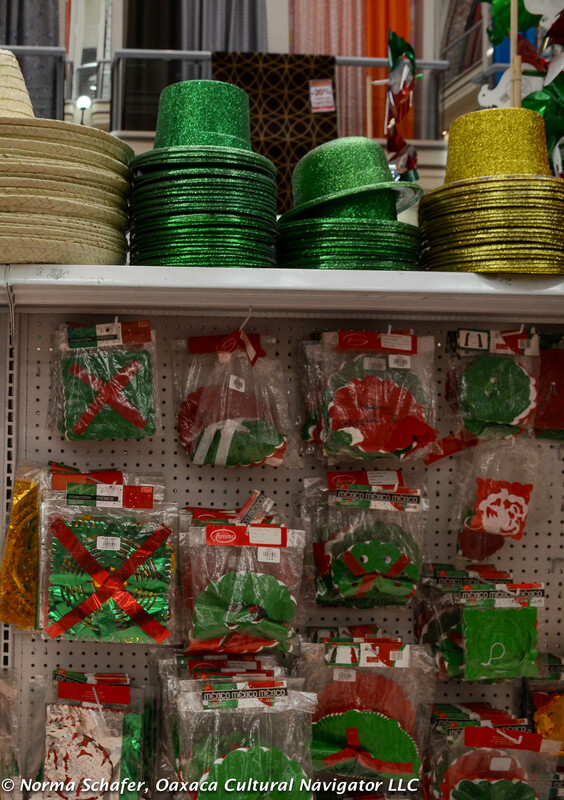 Flags, bunting, parades, musicians and red, green and white jello cups dominate the landscape. Across the land, mayors, governors and the President will shout out La Grita — the call for freedom from Spain that Hidalgo yelled in 1821. Children will wear the colors of their country. There is even a Liberty Bell. 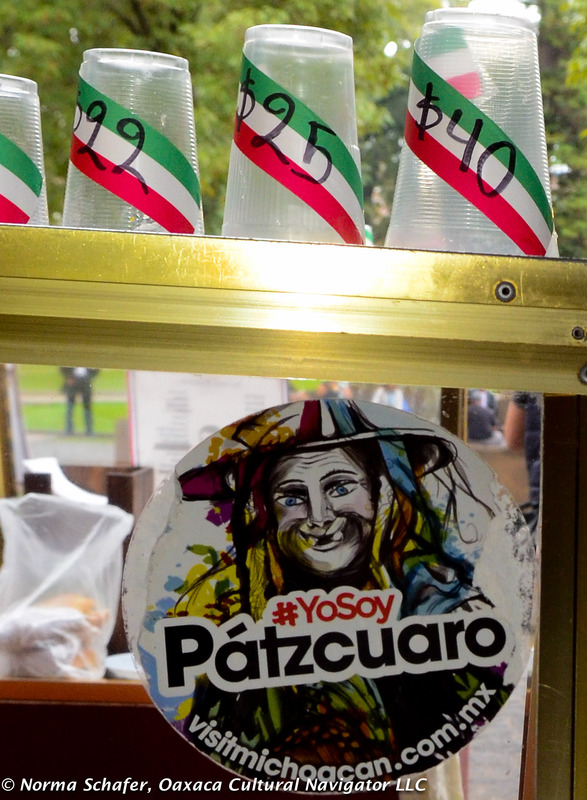 This is a photo tribute to Mexico and her Independence. 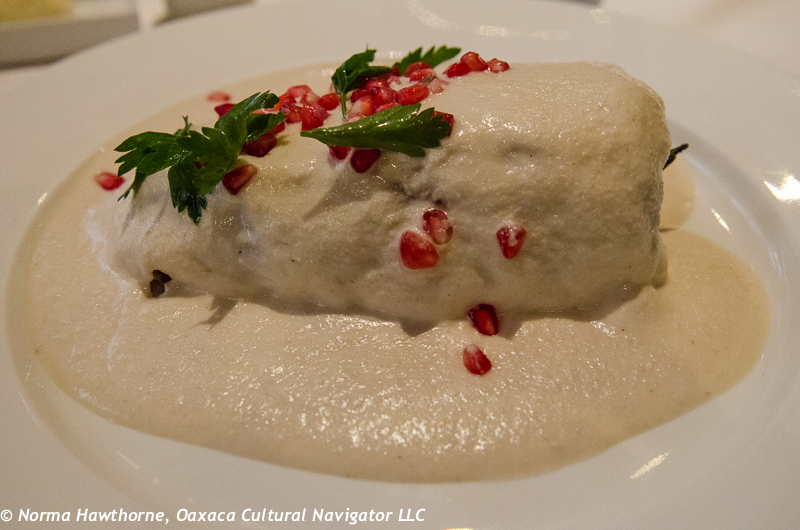 The feast of the season is the red, white and green taste treat called Chiles en Nogada, created by the nuns in Puebla for General Iturbide who became Emperor of Mexico after independence from Spain. I’m not sure that Mexico can be topped by any other country for her widespread use of red, white and green. 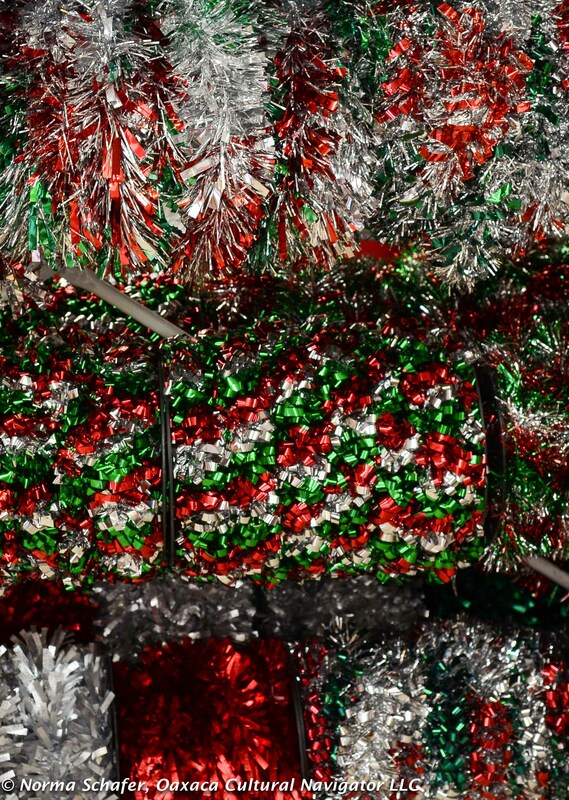 From confections to cake decorations to adornment on buildings, the color of the flag dominates everything this week. 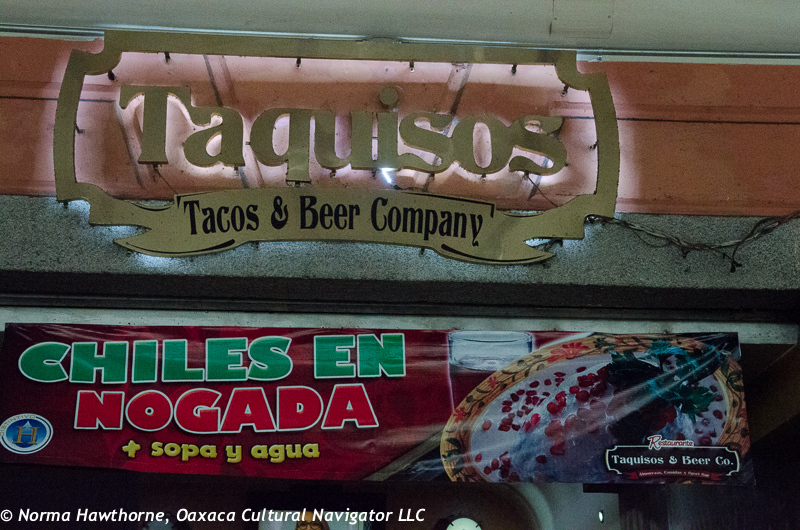 Mexico is a country of do-it-yourselfers. 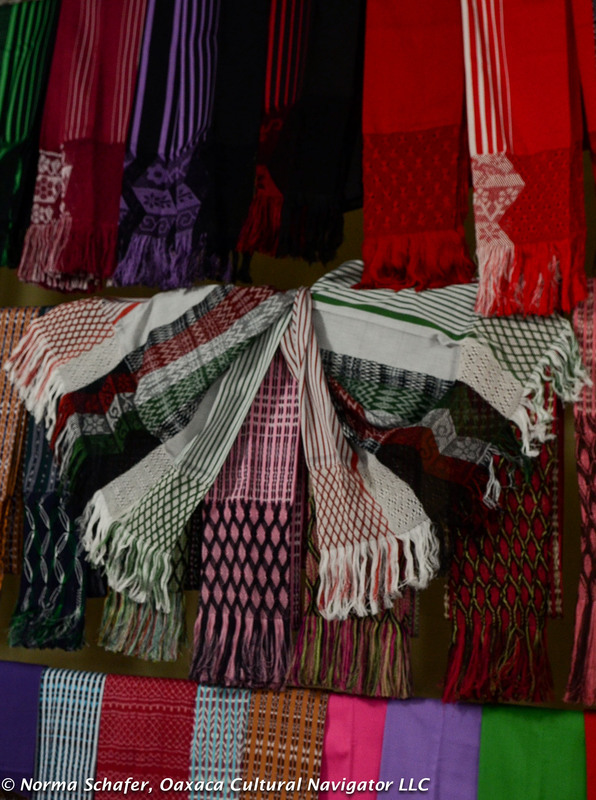 The Parisina fabric store (it seems like there is one in each medium to large size town) is filled with enough notions, textiles and glitter to outfit each man, woman and child in the country’s colors. And, if you need a flag, look no further than your neighborhood street corner, where you can get one in any size. Add a feathery hair adornment, a horn, a drum, and a whistle and you’ll be ready to join any band in town. 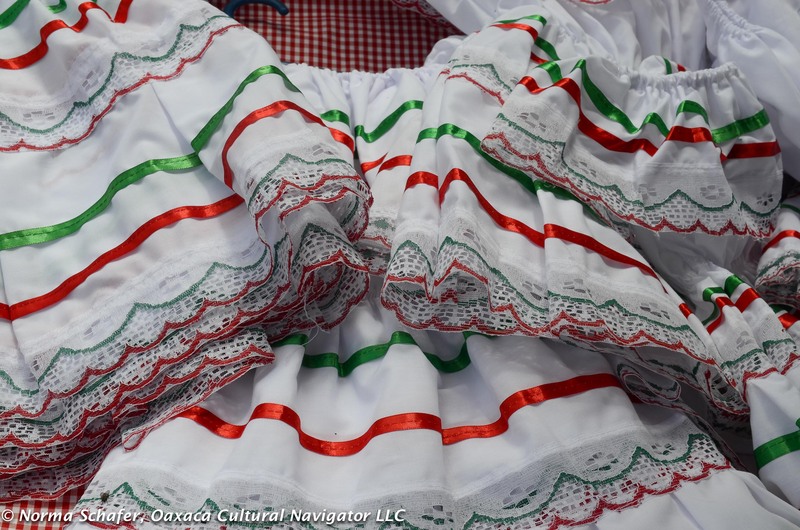 At the Feria del Rebozo in Tenancingo de Degollado, State of Mexico, I saw many finely woven shawls that were in the colors red, white and green. They were hung like flags on display and I know that many women coveted them. 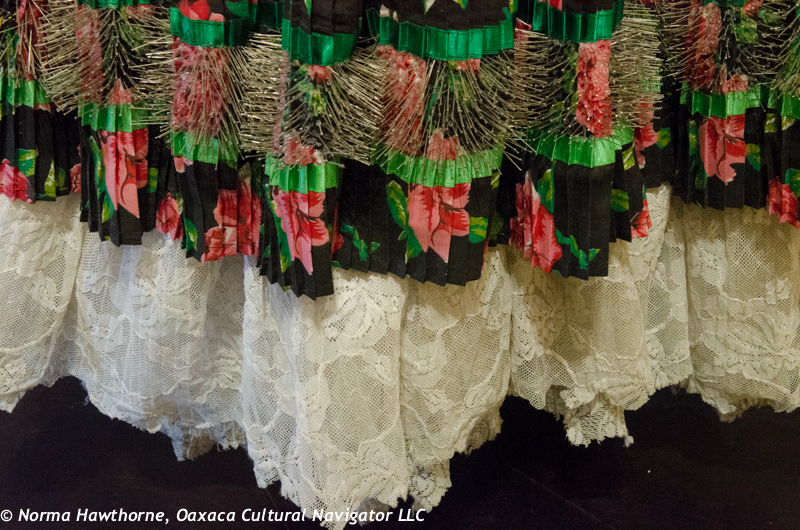 Even at Casa Azul, home of Frida Kahlo and Diego Rivera, an exhibit of her clothing featured a skirt in patriotic colors. I’m writing this on the night of September 15. The firecrackers just went off. I heard the mayor call La Grita. Time to go to sleep, if I can sleep. Who knows how for how long the firecrackers will crackle and sizzle and burst with sound. Sending wishes for peace and freedom for all. 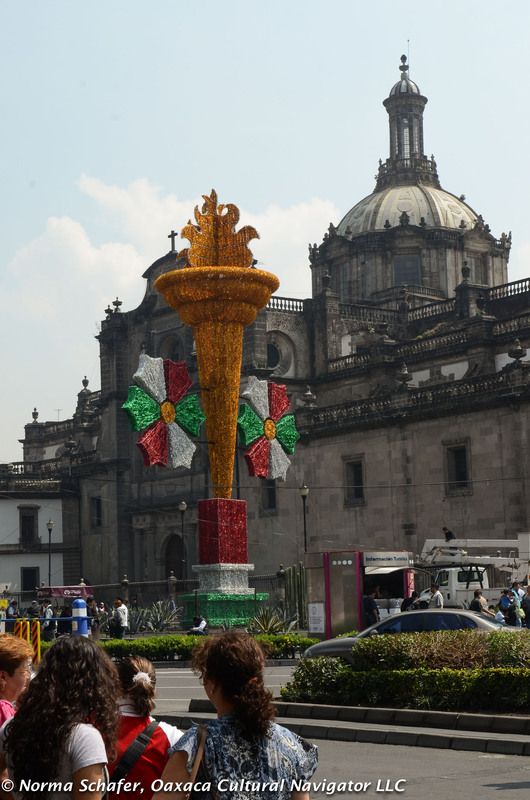 On September 16, we’ll go to the zocalo for the parade. Every Independence Day needs a parade, yes? 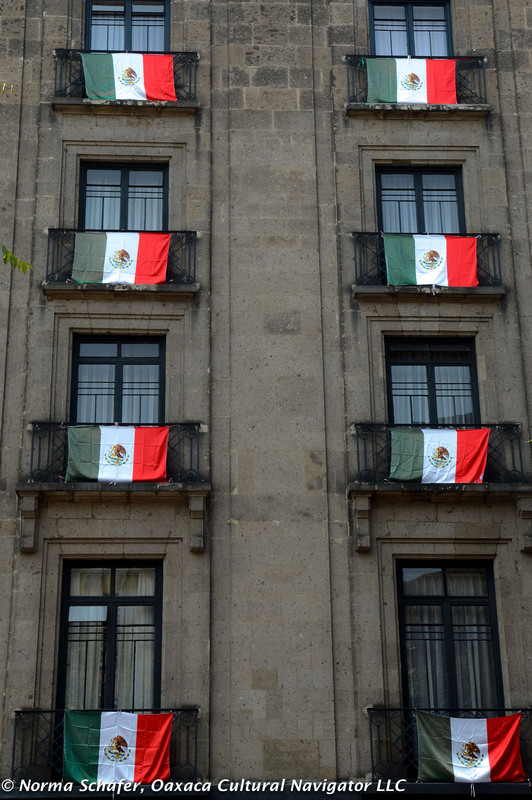 On September 16 each year, Mexican Independence Day, the president of Mexico stands on the balcony above the entrance to the National Palace in Mexico City facing the huge Zocalo filled with people. 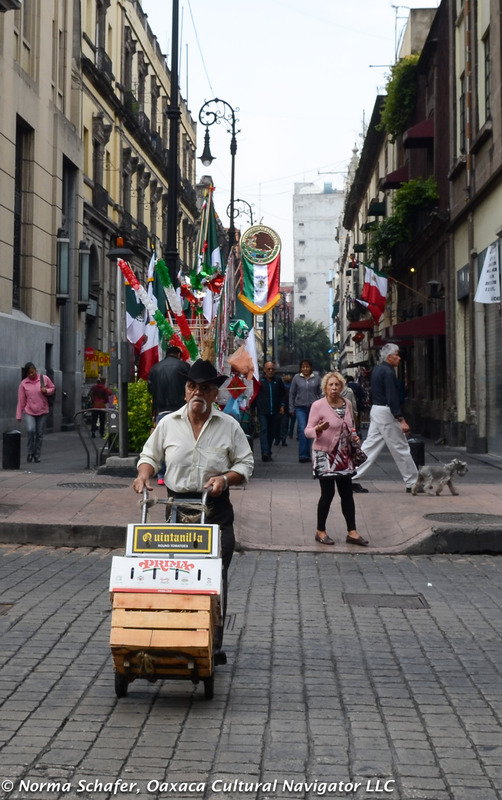 He recreates Father Miguel Hidalgo’s famous shout Viva Mexico! Viva la Independencia! that Hidalgo made from the church in the town of Dolores in the state of Guanajuato, on September 15, 1810. 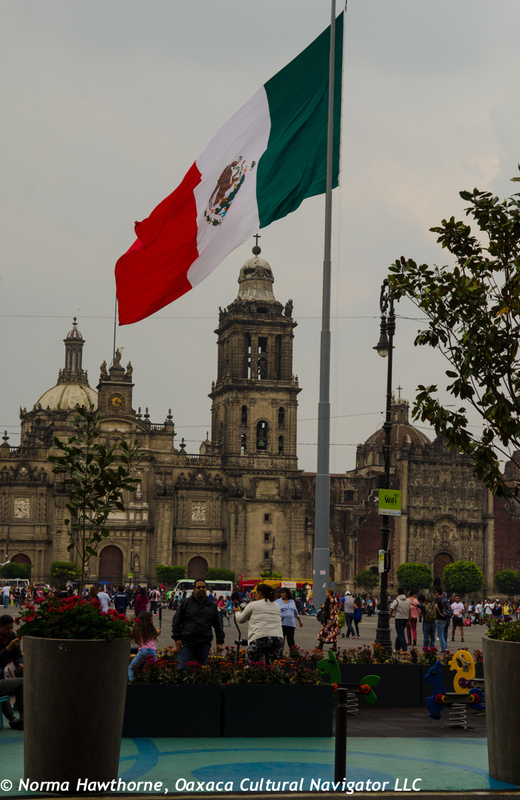 Thus began Mexico’s war of independence from Spain which was not fully realized until 1821. 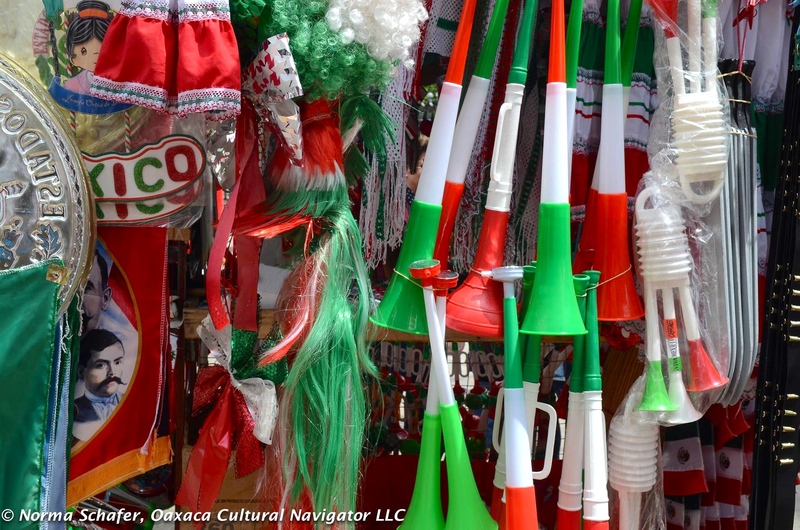 Known as El Grito de Dolores, the cry is the most important symbol of Independence Day. 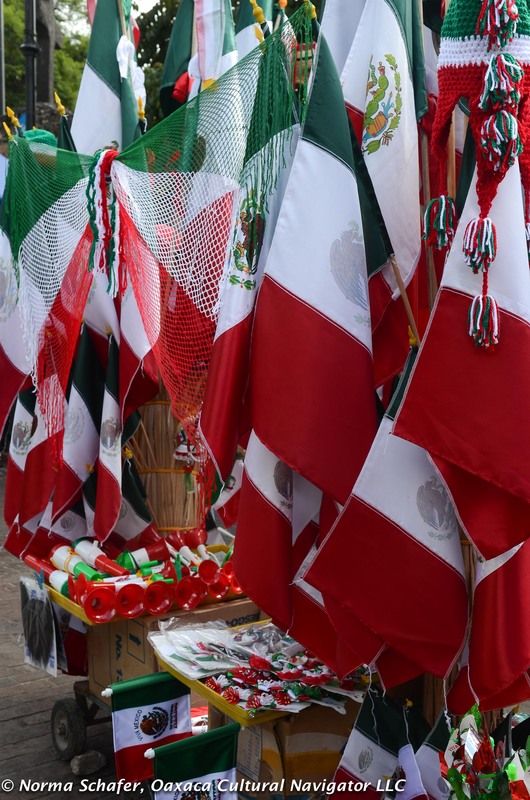 Each year at eleven o’clock in the morning, mayors and governors of cities and states throughout Mexico echo it as citizens gather to join the shout. 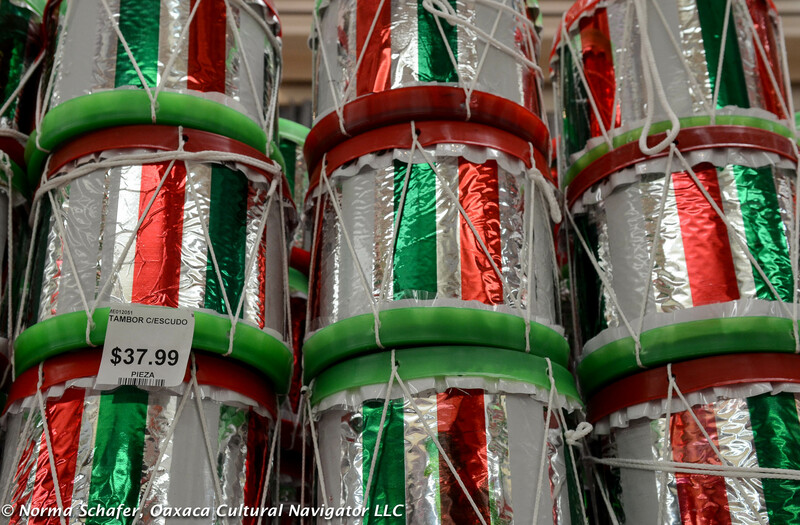 Some think that Cinco de Mayo is Mexican independence day. It is not. Mexico’s General Iturbide rode into Mexico City in 1821 to decidedly end the War of Independence. 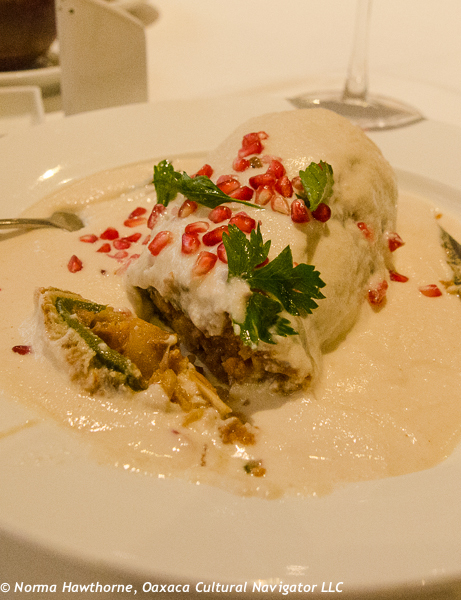 The Puebla nuns, also known for their mole poblano, created the red, white and green Chiles en Nogada in his honor. 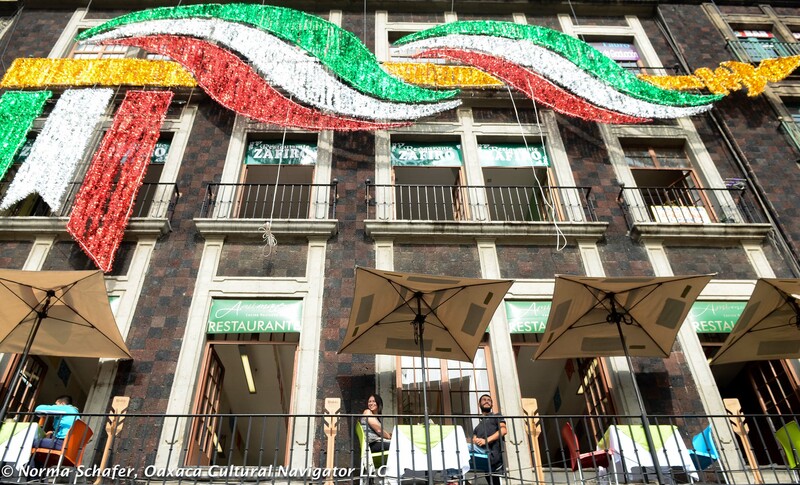 He’s the man who designed the Mexican flag. The other Mexican revolution started on November 20, 1910. Also known as the Mexican Civil War, the ten-year conflict succeeded in ousting the thirty-year dictatorship of Porfirio Diaz. Travel every city, town and village in Mexico and you will see streets named for the revolutionary heroes and the dates of independence. Viva Mexico! Viva la Independencia! Give a shout out! It’s a Chile en Nogada kind of day here in Puebla, Mexico, where it was first prepared by Augustinian nuns, so they say, to honor the birthday of General Augustin Iturbide on August 28, 1821, who orchestrated Mexico’s independence from Spain on the same date. I ate one Chile en Nogada today here at El Mural de Los Poblanos. One s not enough. But, lo, I won’t be here long enough, gone by the time you read this! No second day for a second helping. 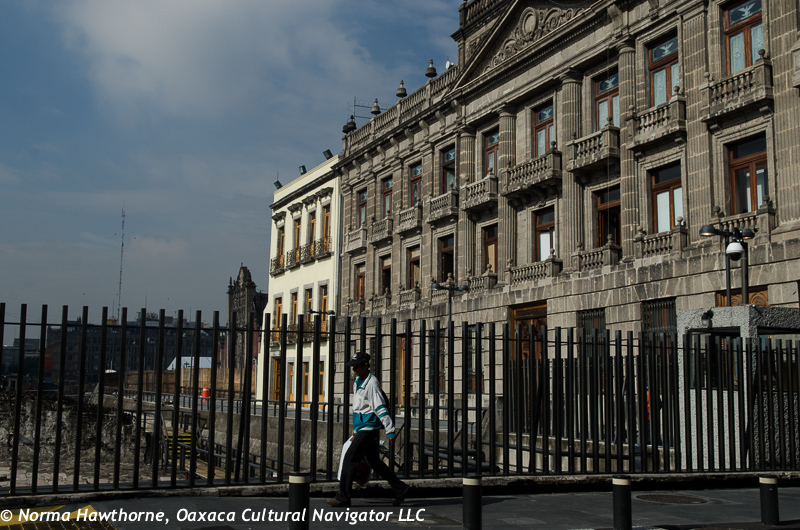 History notes that it took Iturbide less than a year to secure independence after he put together a three-part coalition of liberal insurgents, landed nobility and the church who had been in-fighting for ten years. He formulated The Three Guarantees: Freedom from Spain, Religion (Catholicism only) and Union (all Mexicans treated as equals). 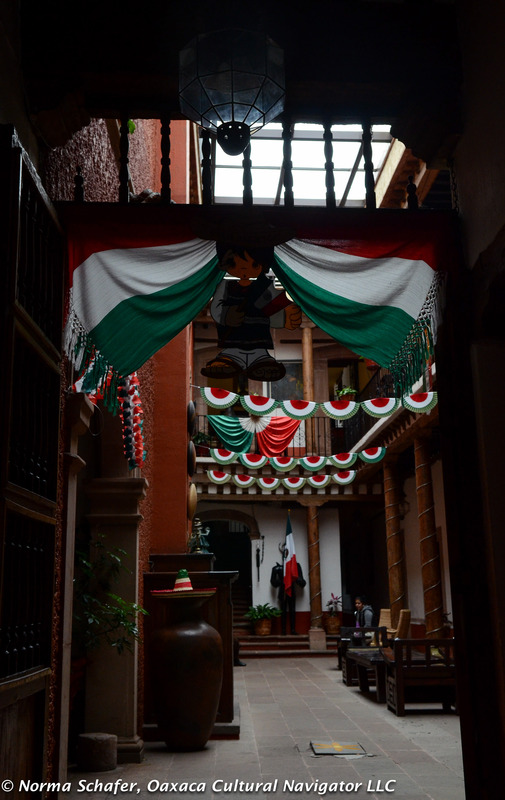 Iturbide translated The Three Guarantees into the Tri-Color Mexican flag — green, red and white — and added the Aztec symbol of the eagle perched on a cactus to build upon the past. 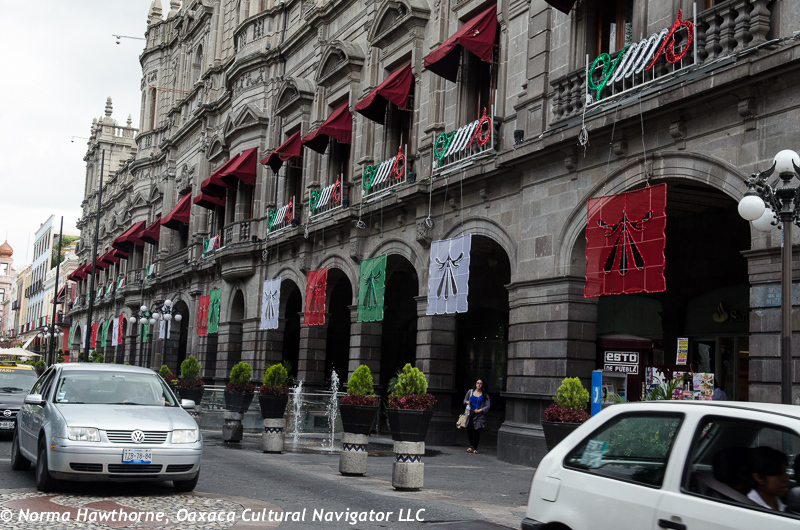 The city is decorated to honor the occasion and the Chile en Nogada season. 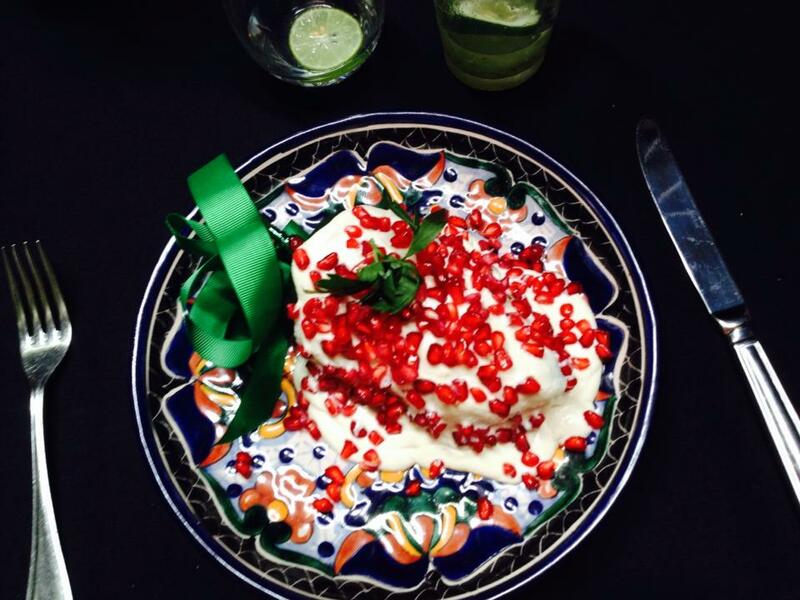 The nuns created the Chile en Nogada to honor the man who created the first Mexican independence. 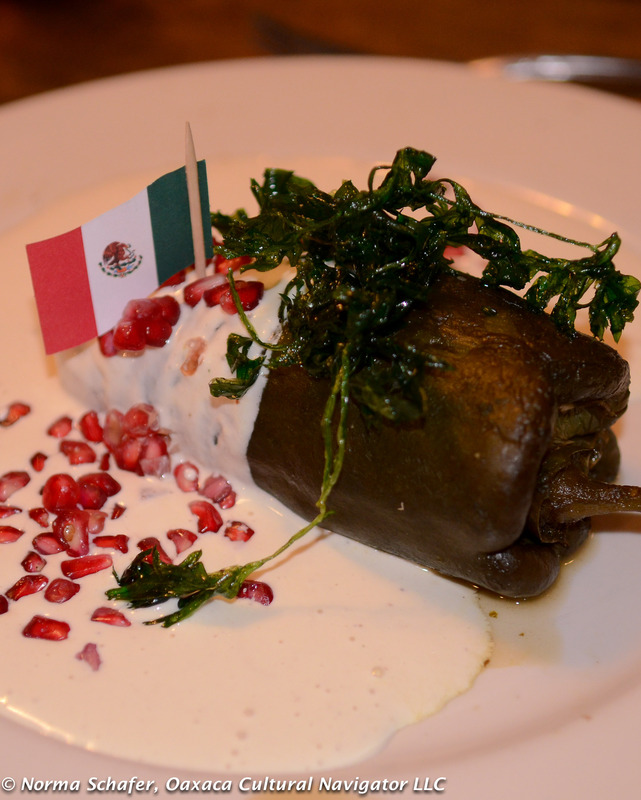 The dish is tri-color: A beautiful poblano chile stuffed with minced pork, fresh fruit, pine nuts and savory spices (green), topped with a fresh walnut and cream sauce (white) and garnished with fresh pomegranate seeds (red). 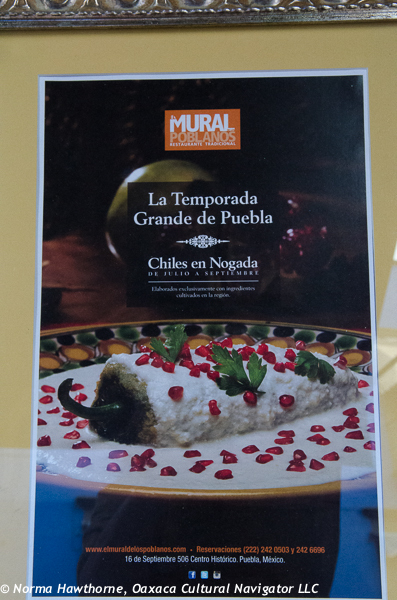 Today, chile en nogada is THE seasonal dish in Puebla. 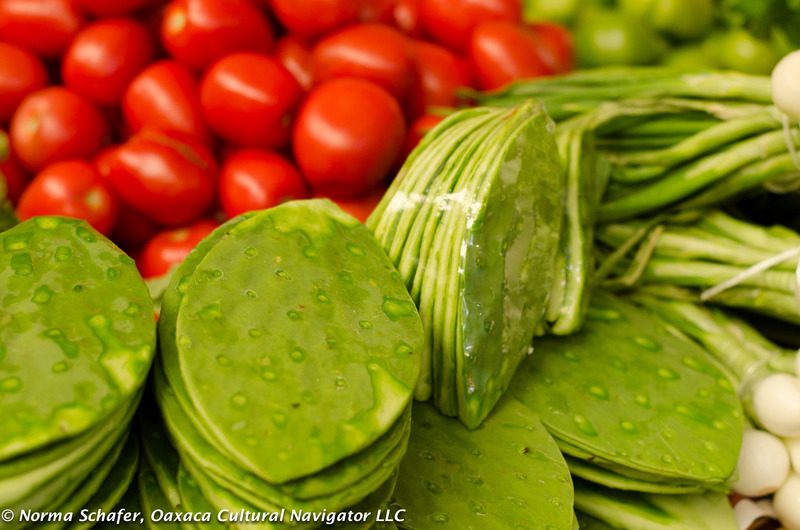 It is a culinary masterpiece along with the other masterpiece of Puebla origins, mole poblano. Every restaurant tries to capitalize on the popularity of this famous dish. Chile en Nogada is available fresh only from July to September when pomegranates are ripe, peaches and apples are in season, and mild poblano peppers are prolific. No restaurant does it better than El Mural de Los Poblanos. I’ve been coming here for years and the preparation, presentation and taste never wavers from excellent. 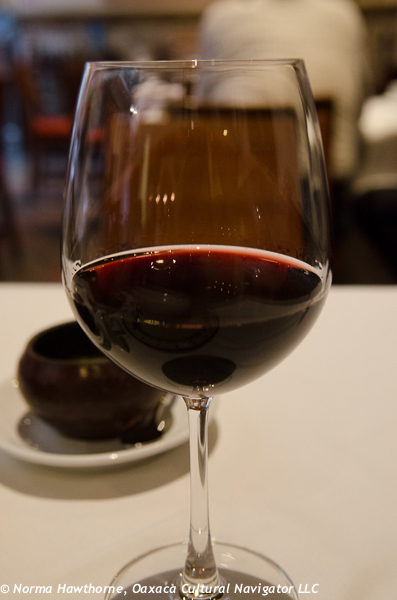 Paired with Casa Madero 3V red wine from Coahuila, Mexico, this meal was cien percento (one hundred percent) Mexicano. Chef Lisette Galicia’s Chile en Nogada is stuffed with a picadillo of pears, apples, pine nuts, raisins and ground pork, seasoned with hints of North African spices that point to Spain’s Moorish history. 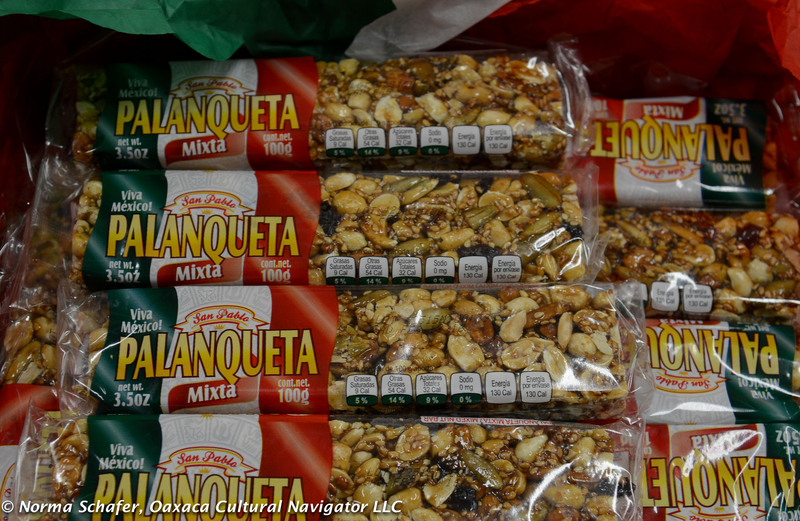 It is a perfect combination of sweet and savory. 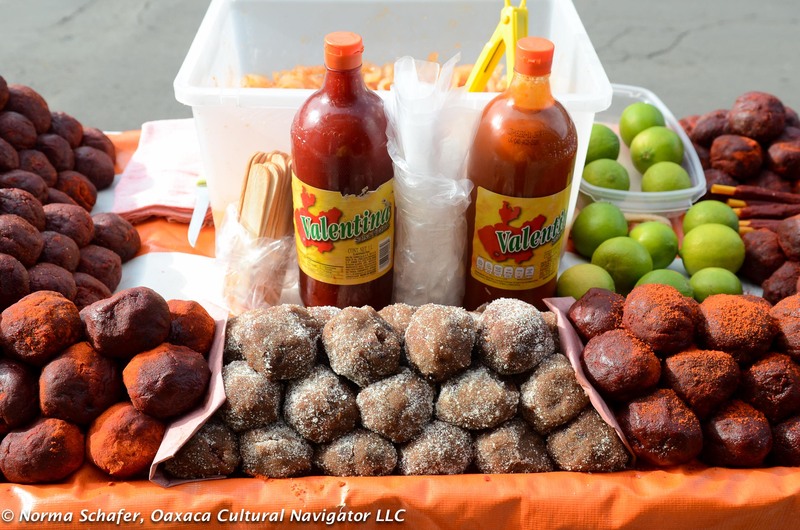 The version here is a sweeter nogada sauce, a counter-point to what I tasted the week before at Mexico City’s Azul Historico, where two sauce versions, one sweet, the other savory, were available on the menu. Now, it’s off to El Norte for a while. Hasta pronto. I’ll be dreaming of you, Mexico. 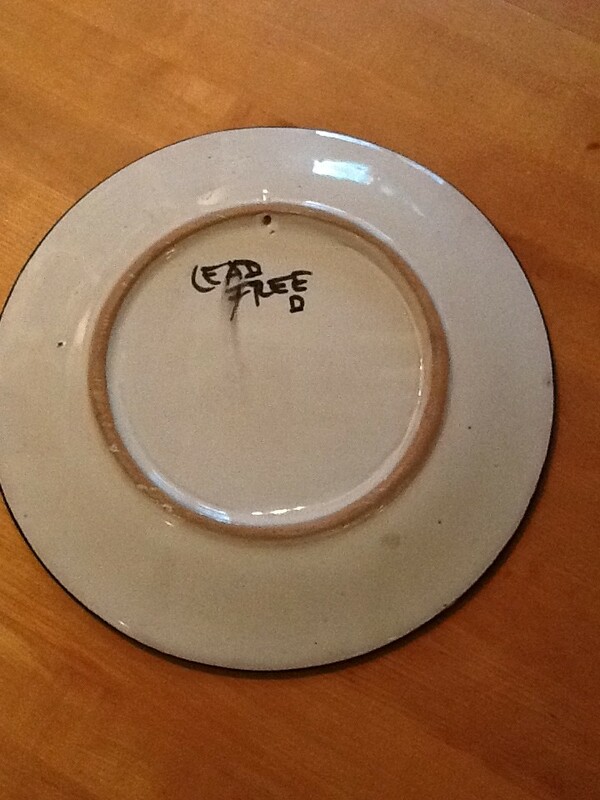 First, a beautiful, hand-painted and lead-free plate from the village of Dolores in the State of Guanajuato. Home of Miguel Hidalgo y Costilla, the Roman Catholic priest who first cried the El Grito de Dolores, the town is now famous for its brightly colored, hand-painted ceramics. 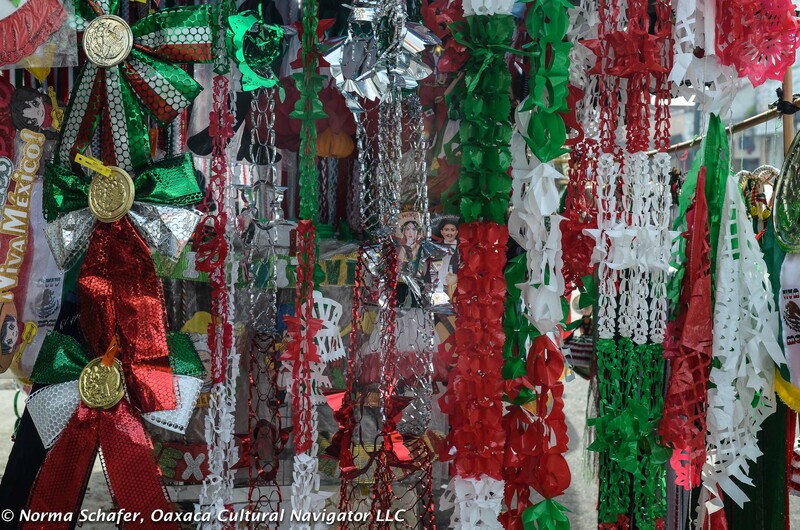 Hidalgo’s famous cry for Mexican independence from Spain is marked by celebration throughout the country on September 16, commemorating the first cry in 1825. 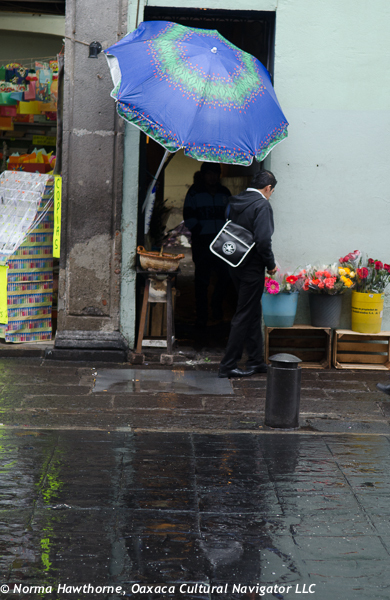 The town changed its name to Dolores Hidalgo to honor the man who rallied the people to determine their own destiny. Viva Mexico! SOLD. 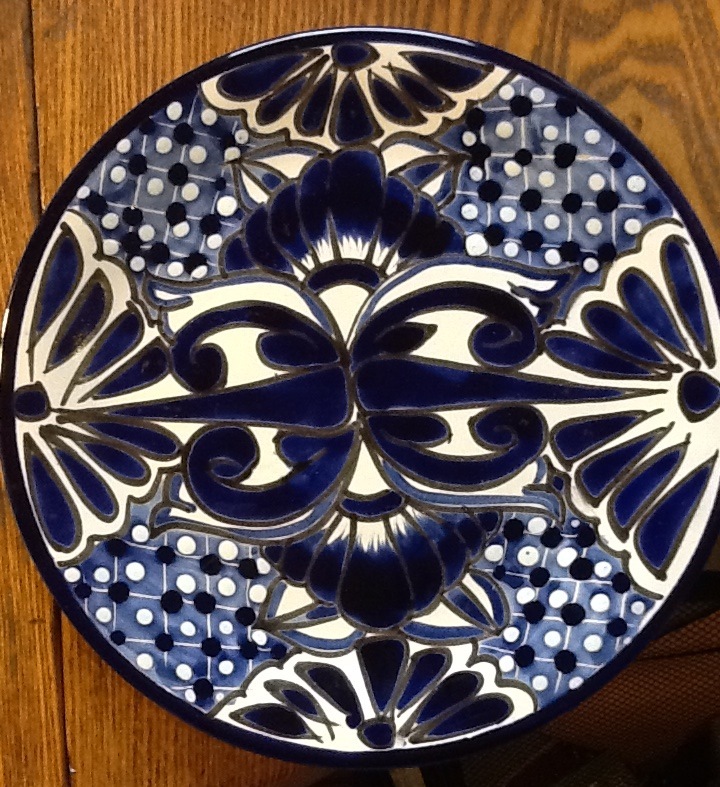 An incredible, bold royal blue, lead-free, hand-painted dinner plate from Dolores Hidalgo. I bought this beauty at a lovely shop directly across the street from the church where Hidalgo sounded his famous cry. Measures 10″ in diameter. Has holes in the foot of the plate to hang it on a wall. $35 USD includes shipping to anywhere in the continental USA. 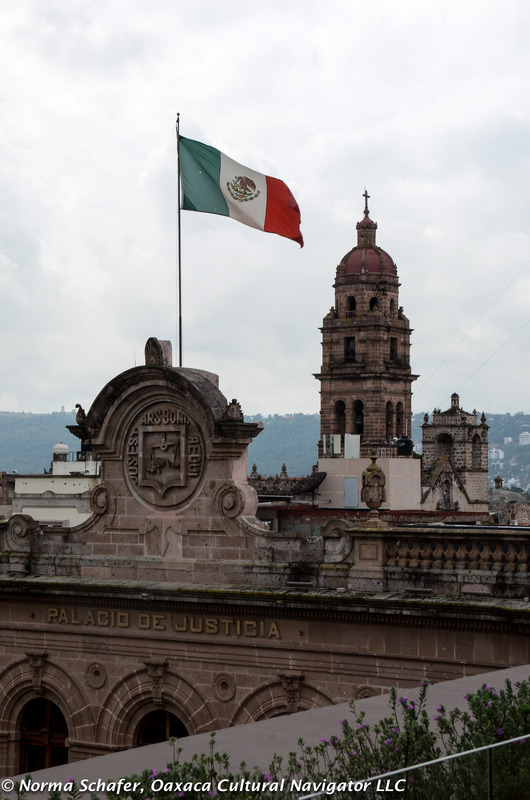 The Battle of Guanajuato occurred four days after Hidalgo’s famous cry. 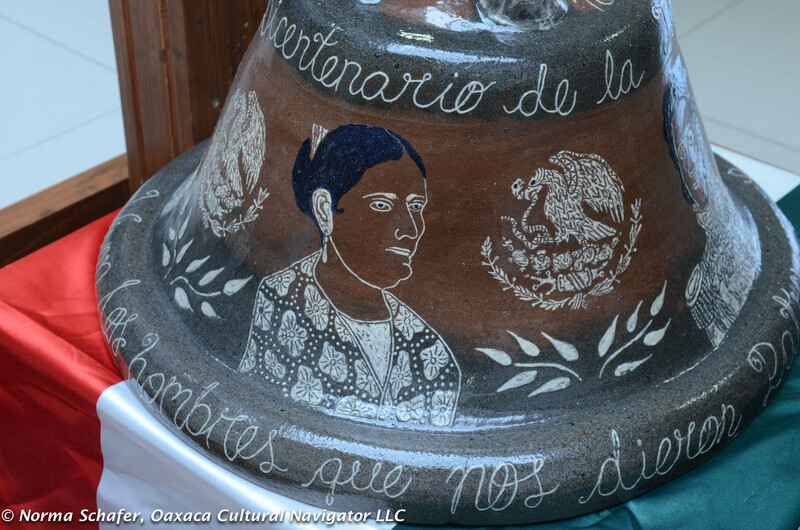 Nearby is the village of Santa Rosa where another pottery makes lovely hand-painted majolica. The painting is delicate, subtle and Italian in style. 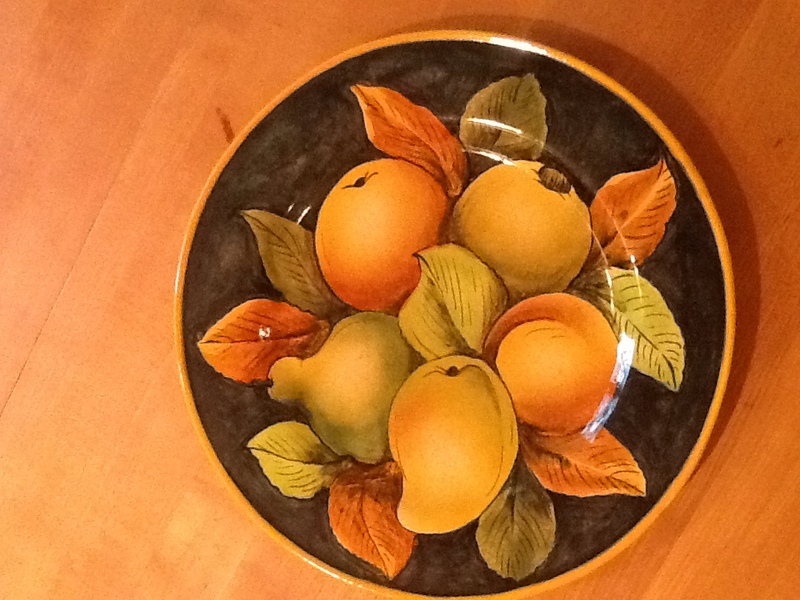 Here, rich, warmly painted plate is decorated with a pear, mango, peach and lemon on a blue/green background. Measures 10-1/2″ in diameter. Suitable for hanging. $48 USD includes shipping to anywhere in the continental USA. Please send me an email first if you are interested in making a purchase. I’ll let you know if they are still available and I’ll send you a PayPal invoice. 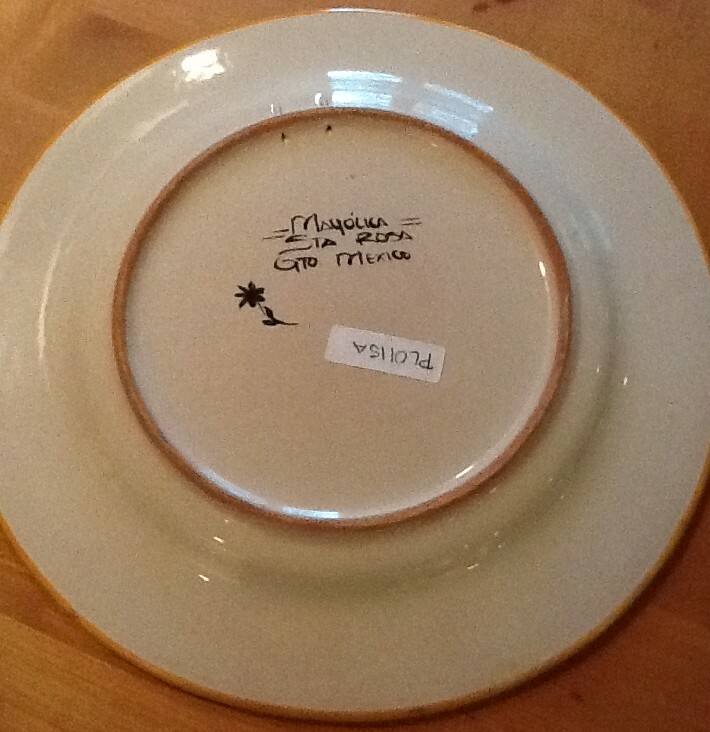 Left is mark for the Santa Rosa Majolica plate with fruit. Right is Lead Free mark for blue Dolores Hidalgo plate.